Dimensions 0.57 by 6 by 9 in. Amazon.com description: Product Description: The following pages were not in the first instance written to prove the divinity of the Catholic Religion, though ultimately they furnish a positive argument in its behalf, but to explain certain difficulties in its history, felt before now by the author himself, and commonly insisted on by Protestants in controversy, as serving to blunt the force of its primÃÂ¢ facie and general claims on our recognition. However beautiful and promising that Religion is in theory, its history, we are told, is its best refutation; the inconsistencies, found age after age in its teaching, being as patent as the simultaneous contrarieties of religious opinion manifest in the High, Low, and Broad branches of the Church of England. In reply to this specious objection, it is maintained in this Essay that, granting that some large variations of teaching in its long course of 1800 years exist, nevertheless, these, on examination, will be found to arise from the nature of the case, and to proceed on a law, and with a harmony and a definite drift, and with an analogy to Scripture revelations, which, instead of telling to their disadvantage, actually constitute an argument in their favour, as witnessing to a superintending Providence and a great Design in the mode and in the circumstances of their occurrence. About: John Henry Newman (1801-1890) was a prominent figure in the religious history of England during the 19th century becoming nationally recognized by the mid-1830s. 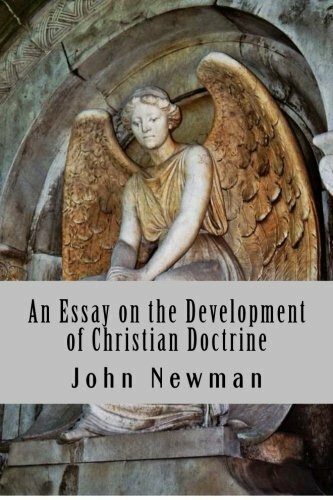 from Createspace Independent Pub (July 6, 2011); titled "Essay on the Development of Christian Doctrine"
About: One of the founders behind the Oxford Movement in England in the 1830's and early 1840's, Cardinal John Henry Newman's research into Church history troubled him because he did not realize how far the Church of England had drifted in essence and principles from those of the early Church.